The Apostles with Mary receive the Holy Spirit. There's wind and tongues of fire that usher in the Holy Spirit. Our church celebrates this feast with the bright color of red. We had a Pastor once who requested that everyone wear red to Mass on this day. The whole church was ablaze with the Pentecostal fire. I still wear red every year on this day! 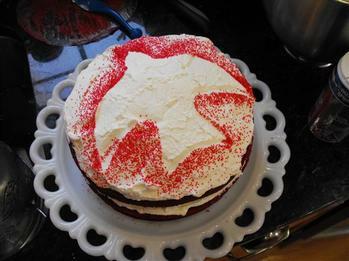 This is easily made by cutting out a paper dove, placing it on your white frosting cake and then sprinkling with red sprinkles. Jesus is conceived by the Holy Spirit of the Virgin Mary. Meditation: The Holy Spirit shall come upon thee and the power of the Most High shall overshadow thee. There the Holy One to be born shall be called the Son of God (Luke 11:35). Prayers: One Our Father and Hail Mary; seven Glory be to the Father. The Spirit of the Lord rests upon Jesus. Meditation: When Jesus was baptized, He immediately came up from the water. And behold, the heavens were opened to Him, and He saw the Spirit of God descending as a Dove and coming upon Him. (Matthew 3:16). Jesus is led by the Spirit into the desert. Meditation: Now Jesus, full of the Holy Spirit, returned from the Jordan, and was led by the Spirit about the desert for forty days, being tempted the while by the devil (Luke 4:11). The Holy Spirit in the Church. Meditation: Suddenly there came a sound from heaven, as of a violent wind blowing, and it filled the whole house where they were sitting. And they were all filled with the Holy Spirit and began to speak of the wonderful works of God. (Acts 2:2, 4, 11). The Holy Spirit in the souls of the Just. Meditation: Or, do you not know that your members are the temple of the Holy Spirit who is in you? Do not extinguish the Spirit. And do not grieve the Holy Spirit of God in whom you were sealed for the day of redemption (I Cor. 6-19; I Thess. 5:19; Eph. 4:30). Prayers: One Creed, Our Father, Hail Mary; seven Glory be to the Father.